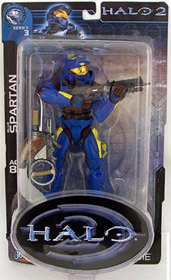 Description Of Item: Please note that we will pick at random which one of the 3 Blue Spartan you will receive. The epic saga continues with Halo 2, the much anticipated sequel to the highly successful and critically acclaimed game Halo: Combat Evolved. In this sequel, the battle comes to Earth, and Master Chief, a genetically enhanced super soldier, is the only thing standing between the relentless alien Covenant and the destruction of all humankind.